1. Can you explain to us the story of BENEA REACH? 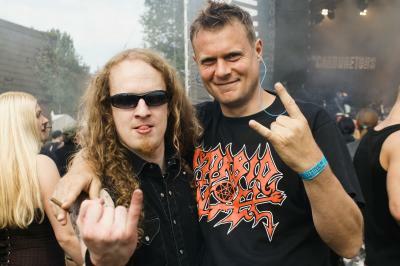 Me and Ilkka (vocals) gathered some friends from various musical backgrounds in 2003, back then we already had some material and a strong vision so Benea Reach felt like a natural step in many ways. After some touring in Scandinavia and Europe, we headed a local studio here in Oslo to record a demo that we later sent out to labels and pretty quickly we ended up with Tabu here in Oslo. Our debut album "Monument Bineothan" came out in 2006 and "Alleviat" came out this year. 2. Where does your band name come from? It is a direct result of our vision, as much as we want to create music we also want to explore ourselves and be able to take turns in both musical and lyrical patterns without loosing the main nerve. For that purpose we needed to identify us around a name that collects all the diversities and dynamics, all the darkness and the shining, all the silent and the chaos... For us Benea Reach has both an external and internal meaning that has more or less cryptic messages but mainly the name carries our vision. 3. What are your musical influences? 4. Please refer your style of music. Is it progressive metalcore, is it postcore or is it only Metal? 5. How are the reactions about your new album Alleviat so far? Awesome, people has realized the progress in production and mixing. We knew that with our move towards a more compact arrangements and a more melodic approach to songwriting "Alleviat" could also reach a more wider range of people and from the feedback we have received so far we can only be happy. 6. In Norway BENEA REACH are definitely no small act anymore (you won a Grammy for your debut album). What is about the rest of Europe? We actually only got nominated, but it felt like winning being the only Oslo band nominated in the Metal category. We will just have to keep on working and doing what we do best and only time will show how far we will reach. 7. Your new and second album Alleviat is very atmospheric and very massive, the album is darker and more melodic than "Monument Bineothan". What would you say? it is interesting and uplifting to hear that an album like "Alleviat" can be interpreted in so many ways. 8. What are the lyrics talking about? Can you explain the album title? We usually do not border ourselves in any agenda or theme, we let the music lead us emotionally and try to pic up threads that later lead to full lyrics. "Monument Bineothan" is plain English and Old English and means "Monument from below" and felt like a natural step to begin with, we felt that we had a massive package that will "rise from under" and stay like a monument. The music we wrote to "Monument Bineothan" led us to release some lyrical themes of a more darker and apocalyptical atmosphere so to speak. Some lyrics described fear of future, others carried depression and sorrow while some lyrics had a more positive fighting spirit in them. "Alleviat" was pretty much positive all the way, a well needed progression from the previous lyrical paths. We kinda needed a step towards a more forward seeking, hopeful and a lighter universe. "Alleviat" is late Latin and means "Make suffering less severe". 9. There are a lot of anti-christian Norwegian musicians. Would you consider yourselves as a religious band? No. We do not have a religious agenda nor are we religious outside of the collective. We all do however believe in a spiritual dimension that is very real for each and one of us. This is something that we all keep on a personal level and non intentionally outside the band, we do actually not talk about our beliefs as much as we could within the band so it would be awkward to share those thoughts to an audience. 10. The sound of Alleviat doesnt sound like a typical Tue Madsen thing. Do you agree with that? Yes, I agree. We actually wanted him to do "Monument Bineothan" due to his skills and what he did for "Alleviat" is plain amazing. He showed a lot of interest already from the preproduction stage and we wanted him to have total freedom in what he does. I guess that when one enjoys the product from start it becomes easier to polish it to a master piece and I feel that Tue polished "Alleviat" in that sense. The mastering at Cutting Room / Stockholm was therefor a pleasure, I remember the reactions and the comments on the high quality mixing and precision in every detail. 11. Can you tell me something about the special artwork. What is the reason to wear uniforms? Well, the artwork is a part of the expression and therefor very important. I have actually always felt a need to be able to translate the music we do into images and covers, merch and also videos and uniforms. The uniforming is a way to unite us when we are out and when we feel that it fills a purpose. 12. Which albums are your all time faves? 13. What are your immediate future plans? Are there any plans for an upcoming tour? Check out www.beneareach.com for info, pics, music and videos.